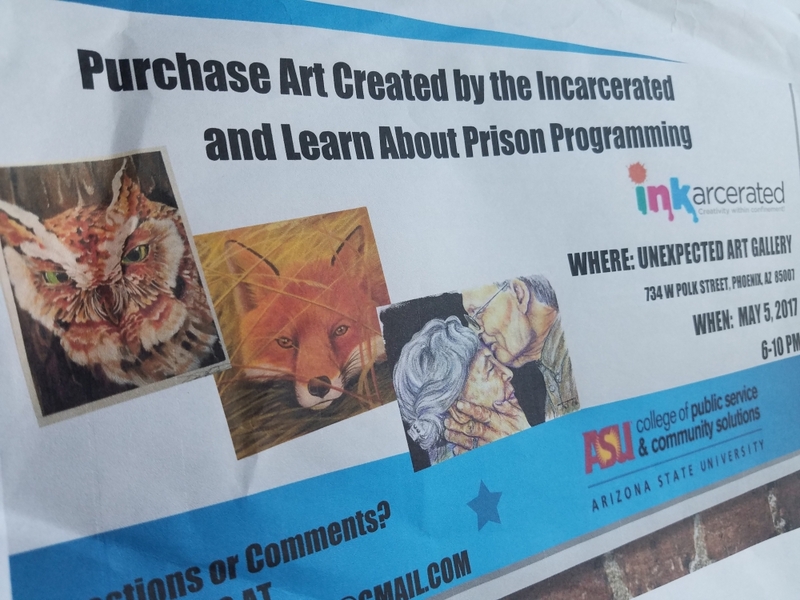 Nine freshmen in a project-based class, ASU 140 “Prisons: Getting Out and Staying Out,” are preparing to host an art show with artwork created by prisoners. “Inkarcerated: Creativity Within Confinement” will take place May 5 at the Unexpected Art Gallery in downtown Phoenix. The show will display about 50 to 70 pieces of art in different mediums created by inmates at the Arizona State Prison Complex in Florence, Arizona. According to students in the class, taught by Kevin Wright, they are working to raise awareness about effectiveness of programming in prisons that could aim to reduce high recidivism rates, which is when convicted inmates are arrested, convicted and incarcerated again after their release. Last Thursday, the students visited five inmates from the east unit of the prison. Criminology and criminal justice freshman Sandy Moshi said misconceptions toward convicted inmates are common. At least 95 percent of incarcerated individuals will be released to the public eventually, Moshi said. Because of that, she said, effective prison programming can help them come back better and changed. Moshi said for some of the inmates, participating in the show has been a positive experience for them, as well as self-esteem boosters. Criminology and criminal justice freshman Matthew Kothe said the team had some of the inmates write about their art and involvement inspiration to include in the show. “One of them was, ‘I drew my girlfriend because she’s the love of my life, but I also wanted to contribute something to help the kids,’” Kothe said. Kothe said one of the most common inspiration for the inmates was helping the children in need. Proceeds from the show will go to two charities. The first is Children First Leadership Academy, a public charter school with students at the poverty line. The other one was chosen by the inmates and is the Pinal County Family Advocacy Center, a place that helps provide recovery for victims of child abuse or sexual assault while also working to prosecute the crimes. Kothe said one of the programs in the prison includes a “hobby shop,” a platform for inmates to create art. Through the hobby shop’s optional eight-week course, an inmate teaches others how to draw and paint. “It allows them to be creative and be themselves,” Kothe said. Participating in creating art is a way of receiving job experience for the inmates as they think of how they could use it for income and a livelihood when released, Kothe said. For example, one inmate would like to be a tattoo artist and another would like to be a cartoon artist for comics or children’s books, Kothe said. “Through the art show, we want people to know that (the inmates) are just people,” Kothe said. As the class is a year-long course, students have been preparing for the project since the fall 2016 semester. Through their work and efforts, the students feel that it is a great learning opportunity. Flyer for the Inkarcerated: Creativity Within Confinement art show hosted by nine criminology and criminal justice freshmen. Criminology and criminal justice freshman Genevieve McKenzie said she was able to listen to how the art programming has allowed some inmates to make a transition from who they used to be to who they are now. McKenzie said she learned that many of the contributing artists would not normally participate in something like creating art or the art show until they knew it was for the children. “They understand how important it is to make sure that the next generation grows up in better circumstances and has a lot of resources available to them,” McKenzie said. “If we can understand why they’ve committed the crime and use that to change their behavior and make sure that they can be a productive member of society, I think that’s just so much more important,” McKenzie said. When finding a venue, McKenzie said the Unexpected Art Gallery was a “raw, empty space” in which they would learn how to craft into the needs of the show and make it their own. The students said the owners of the gallery were supportive of the show as well, allowing them to do what they want to do with it. “Artwork is artwork,” said Ben Smith, CEO of the Unexpected Art Gallery. Smith said the gallery hosts about two or three types of art every month with various artists, shows and performances that carry different messages. The students will curate the show and will be selling the original artwork along with a copy of the inmate’s inspiration per piece as well. Should Native American Tribes Have Their Own Criminal Justice Systems? The intent of this blog is to bring awareness to the stories I find on the net. I do not claim to own the content to anything other than the stories that I compose. Citation credit for non-original content goes to the original authors. Material moved upon request of the author.